No one is answering the front door. It’s still only about 8 a.m. but several voices can be heard coming from the backyard. 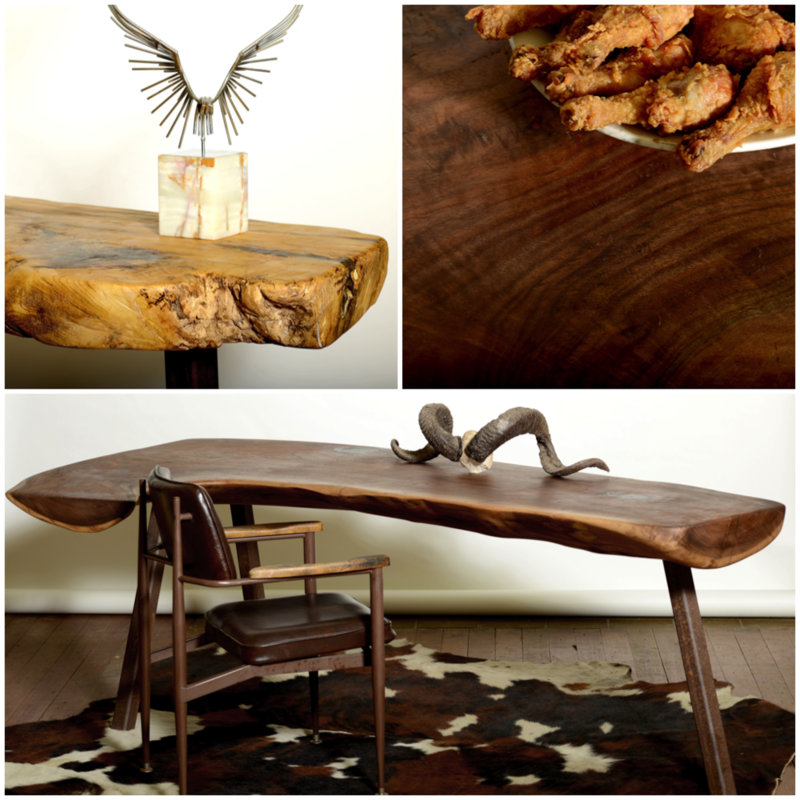 We were invited here to get a behind-the-scenes look at Chad Hagerman Design, where raw wood slabs are shaped into into the sleek, sculptural tables that we first noticed at Big Red Sun. We discreetly let ourselves in through the side gate and follow the commotion to the back of the house. He and his roommate are modeling the spring/ summer line of men’s apparel for Topo Ranch, an Abbot Kinney boutique where another of Hagerman’s signature console tables displays stacks of hoodies and denim. The comfy, quintessential California styles are a natural fit here. Graphic tees and dark cuffed denim mix in against a backdrop of orange and turquoise surfboards, beach cruisers, and a manly pile of chopped-up fire wood. Hagerman is lounging on a patio daybed, strumming his acoustic guitar, as Topo Ranch co-owner Alex Kump oversees styling. More shots are taken out front with Hagerman’s work truck, a 1970 olive green GMC that maintains an authentically rugged charm. The bachelor most certainly leads an aspirational lifestyle here at home in Venice, just off California Ave.
"I surf daily. Whenever there's waves, I'm surfing," says Hagerman. "I do a lot of yoga, go out with friends. I'm a musician as well, so I do play a lot of music." Even this photo shoot is a fun collaboration among friends. Behind the lens is Venice photographer Aleksija Kays who's also done some cool collaborations with Kump in the past. Next time you're in Topo Ranch, check out her dreamy shots of Venice up on the wall. Amidst the wardrobe changes, from green buffalo check to sky blue boardshorts, we move to a small detached garage where Hagerman's design sketches share space with a stack of beat up skateboards and motorcycle. There's a 10-foot slice of raw tree trunk propped up against the wall, Hagerman's next big project. He'll shape and polish this daunting slab into one of his original creations and sell it for upwards of $5000 if it hasn't already been commissioned. His 'Fin' coffee table, $2,200, is a featured item in the Lincoln & Rose Marketplace. Photos courtesy Chad Hagerman Design and Don Flood. "Mainly I've been working a lot with steel and slab wood," says Hagerman. "Sometimes clients want me to build basic stuff, but that's more of my passion, to be working on that kind of thing -- super raw material without straight lines. I like to work with natural shapes." With his background in commercial construction, the inspiration of world travels, a natural gift for design, and years of experience crafting custom carpentry and furniture for himself, his friends and a rapidly growing client base, Hagerman decided to make the leap into retail just a year ago, launching Chad Hagerman Design. His organic modern style fits effortlessly in Venice shops and boutiques. Simon's Provisions, a new wine and gourmet snack shop that opened on Rose Ave., also uses a Hagerman table for the center display. 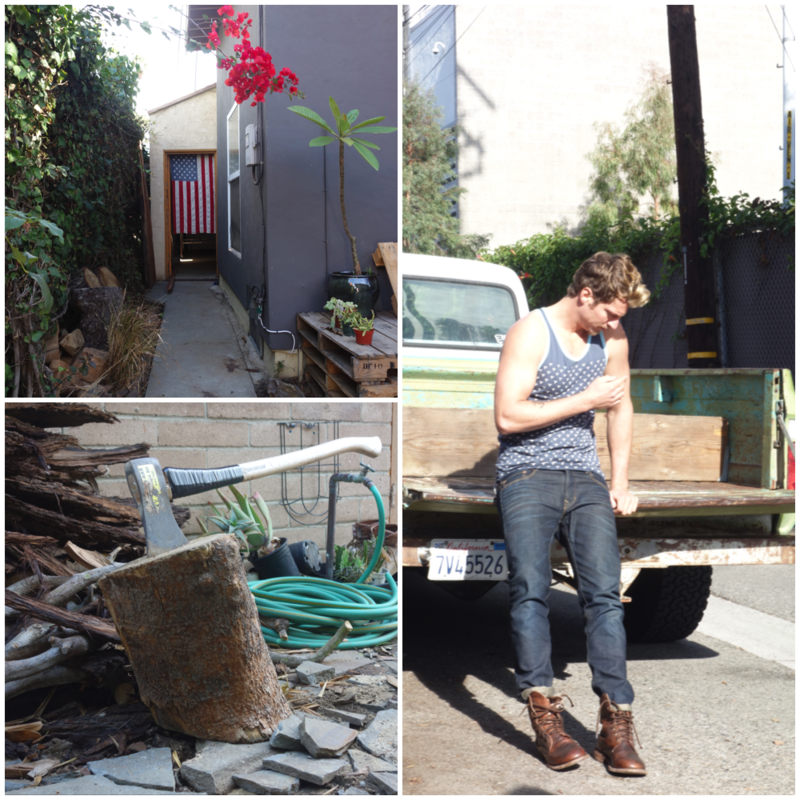 The photo shoot wraps up and Hagerman is off to finish another custom job he's been working on in Santa Monica. Soon after that, a trip to surf and skate company Lightning Bolt to discuss a corporate office design. With so many projects in the pipeline, Hagerman is quickly building a name for himself as a Venice artist to know and one that is primed to make his mark in the design world.